If you count calories, weigh your gear, track your vertical, get weepy at the word “minimalism,” or fancy a lightweight pack/vest for chasing chukar, the Eberlestock Mini-Me might be worth a look. Leslie has donned it exclusively for her debut season as a hunter, and – as far as I can tell from her notes – gives it a thumbs-up. After twenty outings, here are her thoughts. Lightweight: at 3.5 pounds (dry), it’s easily the lightest thing we’ve used on a chukar hunt. Compact: at 19″ x 8″ x 3″, it’s also the most compact pack I can imagine for chukar hunting, which makes busting through brush easier than with my Q5 “Cadillac” Centerfire vest. Very comfortable: the channeled padding on the back will prevent anything from poking your back, and allows a bit of airflow back there, especially nice on a hot day. Hydration system: the Mini-Me includes a three-liter (100 oz.) Israeli-made hydration bladder that works as well or better than any of the CamelBak products we’ve used. Rides high: the “hip belt” on the Mini-Me actually goes across your waist (unless you’re a midget), which means that the accessory pouches you’ll need to add in order to hold shells won’t bang on your thighs when climbing the chukar steeps. Accessory pouches (we have the “small” ones, each of which has plenty of room for a box of shells) slide along the hip belt to you can position them on the side or in the front. Bird bag: made of durable mesh with a drawstring top and compression straps, the attached bird bag stows away inside a zippered pouch when not needed. When it’s out, it will hold lots of birds; on one hunt we put 2 large dusky grouse in it, which seemed to take up less than half the capacity of the bag. Scabbard accessory: if you don’t want to, or can’t, carry your shotgun (or rifle) while hiking (or mountain biking), Eberlestock offers both a long and short scabbard accessory that attaches to a sleeve on the Mini-Me. Although we haven’t used the scabbard in the field yet (we have slings and typically hunt right from the rig), the short scabbard nicely and snugly holds our shotguns with 26″ barrels. Multi-use: one of the reasons I wanted to try the Mini-Me was because in the off-season we do lots of hiking with our dogs and I wanted a pack that I could use for both hunting and hiking, without having to transfer a bunch of safety gear from my hunting pack to a hiking pack. The removable accessory pouches make this possible, and if the scabbard isn’t installed, you can use the sleeve it fits in for storing bulkier items like extra layers or rain gear. We also mountain bike frequently in the off-season, and the Mini-Me works great for that, especially with the hydration bladder. If you do MTB hunts, the scabbard accessory would solve the problem of how to safely carry your gun while riding. Blaze “orange”: it’s more fluorescent pink, but you can see this thing from outer space. It glows bright. I like that, because I can see Leslie easily from many ridges away. If you don’t like this color and don’t need to have a certain number of square inches of hunter orange, the Mini-Me comes in a number of attractive camo patterns. Fit: the Mini-Me does take a bit of adjusting to get it to fit comfortably, as well as to accept the high ride of the “hip” belt. Personally, I would prefer a more robust padded hip belt, but Leslie doesn’t seem to mind the thin nylon straps. Hydration cap: although a small annoyance, the cap on the hydration bite valve is tough to remove and replace with one hand; CamelBak bite valves don’t have a cover on them and we’ve never had an issue with those, so we’ll probably just remove the cap on this one. Accessory pouches can’t easily be fixed on the hip belt so they don’t slide around while hiking; one could modify the belt to fix this but we haven’t tried that yet. Zippers on pouches are tough to open and close with one hand (true of most bird vests we’ve tried). Bird bag clips that attach the top of the bag to the shoulder straps on the Mini-Me are nearly impossible to remove when you want to re-stow the bag. These need to be replaced with something much more user-friendly. Using the game bag: to put birds in the bag, you must take the pack off. Unlike a traditional bird vest, which allows you to slip the bird into the compartment in the back, the Mini-Me access to the top of the bag requires removal of the pack. This hasn’t been as annoying as it sounds, though, because we haven’t constantly nailed birds this season (yet? ), and if we’ve been with another person they can easily put the bird in the bag so the wearer doesn’t have to remove it. Another issue, although not a big one, is that when the bird bag is deployed, it’s a bit tricky accessing the other pockets on the bag; having clips that are easier to remove from the D-rings on the shoulder straps would make this almost no issue at all. Limited storage: just as you wouldn’t carry all your camping gear and outdoor recreation equipment in a sports car, the Mini-Me isn’t intended to schlep every piece of bird hunting kit you might want. But it can hold the essentials in its several zippered pockets, as well as additional clothing, gloves, etc. The accessory pouches you can add to the belt also expand carrying capacity. 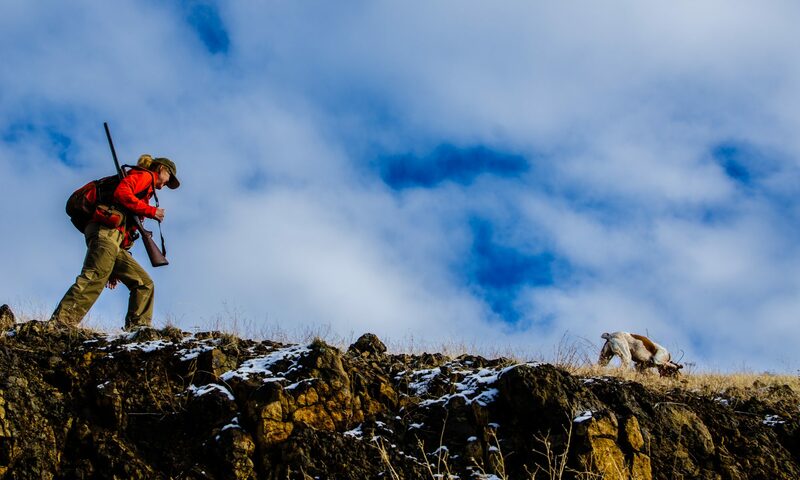 Leslie really likes the Mini-Me for early season chukar hunting, mainly because of its comfort and lightness. She plans to switch to her larger pack for the colder part of the season to accommodate the extra layers and gloves she doesn’t think will easily fit into the Mini-Me. My impression is that it’s a pretty cool option for a lightweight chukar pack, especially because of how much water it holds without being at all bulky. It has worked especially well for us, hunting together, because my vest carries a ridiculous amount of crap in it, stuff we only need one of, like heavy-duty cable cutters (for snare traps), a robust first-aid kit, headlamps, SPOT personal locator beacon thingy, space blankets, and more. Despite its littleness, though, Leslie has found very workable places to carry an FRS radio and her new Alpha 100 hand-held device on the Mini-Me. So there you have it. Let us know if you have any questions. Was laughing at the bite valve cap and bird bag clip comments when I read the review. I’ve left the cap off and taken a mouth full of dust before and realized I should just use it. I’ve given up on properly unclipping the bird bag and instead I move the plastic piece that you push on to the side enough that I can pull the ring out. Just have to remember to move it back over when your done so you can operate the clip properly when you try to put it on next time. The piece is flexible enough to push over and it doesn’t seem to hurt it. Way easier than trying to push it and pull it off the ring properly. Thanks, Jason. Yeah, we’re pretty much on the same page about those two things. Did you get the blaze version or one of the other colors? Will you use it the whole season? I have a Kings camo version that I’ve had for about five or six years now. Use it for turkey hunting, coyote hunting and big game. This year I did some sage hen hunting with it because I had to ride my mortorcycle while my kid drove around with his buddy on my rzr. I love not having to use a sling with the scabbard. Bird bag works well for added layers your shedding during the day. Ha!!!! Interesting. I wish my was more interested in outdoors. We are at the point of “I’m too old to go camping. Either buy a camping trailer with bathroom and shower or go alone.” I’ll be doing a lot of “alone” outdoors adventures. What I suggest as a topic for review would be one on the kind of food you stuff into your bag for that all day hike. I have found oranges and tangerines very tasty and energizing and taste quenching at the same time. Those sugar based protein bars dont do it for me. Another favorite of mine is boiled eggs with a piece of bread plus salt and pepper. Been out 3 days so far and have managed two mountain quail so far. My honey whole is burned and I have been trying new spots. We are getting rain this weekend. Yikes. Now that I see what you make, Its to small. I have been hunting Chukar for 40 + years Can’t fit 6 birds in the pack with all the gear. Wish you would make a vest that could handle gps, garmins, for the dog. Straps like the hunting packs for rain coats Better waist belts, like the hunting pack. Water bottle pouches for easy access .This pack might be great for someone who hunts close to the truck. Not miles from there vehicle in all types of weather.Thanks Ostin for the e-mail. @ the pack. This is not going to work. Keep working on the best pack. ALL OF YOUR OTHER PACKS ARE THE BEST. I SHOW YOUR PACK TO ALL MY CLASSES IN HUNTER ED.